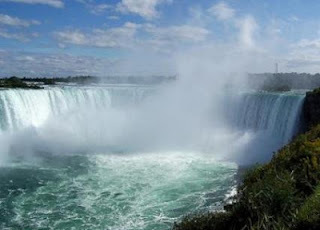 On Wings of Eagles: Niagara Falls, Where Did all this Water Come From? Niagara Falls, Where Did all this Water Come From? Then God said, “Let the waters under the heavens be gathered together into one place, and let the dry land appear”; and it was so. Back in1985 on our Honeymoon we went to Niagara Falls. As we stood there watching the water pour down the falls three question came to my mind. Where did all this water come from?" The easy answer is from the water rain/cycle. Rain would fall in the vicinity of the Great Lakes and eventually, would drain over Niagara Falls. The second question is a little more difficult, where did the rain come from?" As I thought about it the answer came to me, form the oceans. The many oceans on this earth release water vapor, which eventually cooled, condensed and then fell as rain or snow. But her final question stumped me. "Daddy, where did the water in the oceans come from?" With research, I discovered planet Earth has 1,400,000,000,000,000,000 (1,400 quadrillion) tons of water. Indeed, this is a huge supply of the liquid stuff! Just in United States alone, 7 billion tons (1,500 cubic miles) of rain fall each year on the land. Now there are some scientists who suggest that water was dumped on Earth by a zillion comets billions of years ago. This view is intriguing because the Earth's distant brother, the planet Mars, or even our Moon, contain no large quantities of water. Imagine zillions of tons of water falling to the Earth with mega erosive power, and still confined to our earth's borders because of the normal atmospheric pressure of 14.7 lbs/si. If water fell on Mars or the moon, it would vaporize quickly, since there is no atmosphere on that planet. Thus, a difficult chicken-egg question is posed: what came first, the water or Earth's atmosphere? If a zillion comets unleashed zillions of tons of water here on Earth and there was no atmosphere, the water would simply vaporize. If the air was here first, falling water could vaporize as it hits the atmosphere. Even more intriguing is considering this in relation to the Big Bang Theory of the universe. Water on the Earth would have a very difficult time staying within the Earth's gravitational pull if a big bang occurred. Then there are those who suggest that the Earth suffered from a large impact at one time which made a huge chunk of our planet fly away, eventually becoming our Moon. Such an impact would have vaporized much of the water within our oceans and blown away boulders, rocks, sand, particles--anything that would not be fastened or tied to the Earth. Some purport that water hidden in deep cavities within our planet, eventually surfaced, resting in hollow areas called oceans, seas and lakes. However, this theory is losing relative strength. Thus, the question of where water came from will haunt many scientists and geologists forever. I suggest that we accept the simple belief that God created this planet along with its quadrillions of tons of water. Genesis 1:1,2 states that God created the heavens, the earth with its water. Simple, and yet, astonishing--something only to be taken by faith. I hope this make you want to get closer to the creator of everything. Dear Lord we thank You for your creation and for all the reminders there are around us. We pray that we would take the time to give You all the glory and honor for everything. In Jesus, name, Amen.